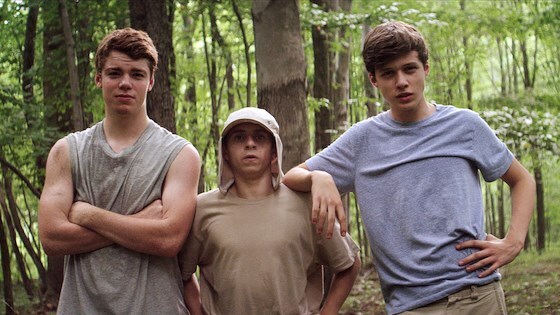 If the kids from Stand by Me accidentally wandered into a movie co-directed by Wes Anderson and Terrence Malick, it would be The Kings of Summer. The debut film from Jordan Vogt-Roberts (who previously directed episodes of Funny or Die Presents for TV) was a hit when it played at Sundance earlier this year, and it's easy to see why. The Kings of Summer is a crowd pleaser that earns its positive buzz: funny and sweet with good performances and great photography. Plus, because it's a smaller "indie" movie (though it's being distributed by CBS Films), it's the kind of thing that audiences can feel good about discovering for themselves and turning into a word-of-mouth hit. Nick Robinson plays Joe Toy, a high school freshman who's grown pretty miserable at home. Since his mother died and his sister (Alison Brie) moved away, it's just been Joe and his dad (Nick Offerman), and they're not getting along. Joe's best friend Patrick (Gabriel Basso of Super 8) has his own problems at home: his parents (Megan Mullally and Marc Evan Jackson) are constantly around, gently nagging and narrating his every move. Finally, the boys have had enough and Joe suggests they move out to the middle of the woods for the summer. Along with Biaggio (Moises Arias), the weird kid at school, the boys build their own house and run away from home, vowing to live off the land and keep their location a secret. All easier said than done, and when Joe's friend Kelly (Erin Moriarty) shows up, things get complicated. 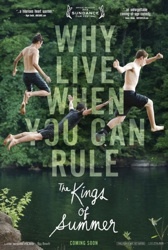 At its heart, The Kings of Summer is a pretty standard coming of age movie about the time in your life between adolescence and adulthood -- a time when you are desperate to begin exerting some independence but perhaps realize you're not ready yet. It's also a movie very much concerned with masculinity. What does it mean to be a man? Is it the ability to hunt your own food and build your own shelter? Is it simply raising a son, or does it mean listening and being sensitive to him as well? Both Joe and Patrick are constantly emasculated in the movie's opening moments: Joe's shirt is ripped off by some bullies while he tries to talk to a girl at school. He is told by an older boy that he can't drink at a party because he's too young. His father embarrasses him in front of the family, reminding him to be quiet because "the men are talking." Patrick's parents hover and discuss his every move; while they clearly do it out of love, they constantly baby him. Puberty has hit in a big, bad way, but no one seems to realize that the boys are growing up. Not that they behave at all in a grown up way. Joe may feel emasculated because he's told he's too young to drink, but he is too young to drink. His father teases and belittles him, yes, but Joe is also behaving immaturely. And his big plan to run away is the furthest thing from an adult reaction one could have. Therein lies the cleverness of the movie, in which characters attempt to live "authentic" lives but do so with mostly hypocrisy. It's not all indie movie cuteness. It's not Little Miss Sunshine. This is a movie that has some ideas. The Kings of Summer also succeeds at being that rare thing: a formalist comedy, as concerned with composition, rhythm and sound design as it is with getting laughs. Vogt-Roberts showcases a great directorial eye -- the movie looks beautiful -- even if it doesn't always cohere into a vision that feels informed by more than other movies. As much as I don't really like comparing movies to other movies (you know, in exactly the same way I opened the review), it's difficult to avoid making connections as the film plays. A shot reminds you of another shot, a story beat reminds you of another story beat. Vogt-Roberts' direction is assured enough that the movie still feels like its own thing, particularly when he focuses on the dreamlike images of nature. The breakout character of the movie will undoubtedly be Moises Arias' Biaggio, because he gets all the best laughs and is memorable in his committed oddness. The character is a miscalculation, though, because he exists only for that purpose -- he's so out-there that he breaks the reality of the film. That's not to say it's a movie too caught up with realism, but there are elements of fantasy (like the building of a two story house from three teenagers who have demonstrated no aptitude for carpentry) that we have to accept or else there is no movie, and then there are elements of fantasy that break the film's spell. Biaggio is a funny character and Arias is great in the movie, but every time he speaks it's like Brick Tamland wandered into frame. The jokes become self-conscious, laid on top of the movie instead of springing from within it. That's a nitpick, though, because the character is very funny and the movie still works. Because, let's face it, the movie is actually stolen by the parents. Offerman isn't doing anything you haven't already seen him do on Parks and Recreation, but he does it so well and is so funny that it hardly matters. Mullally and Jackson, as Patrick's overly-nice parents, kill it in every scene, demonstrating to us exactly why Patrick would want to run away but reminding us why he's crazy to do so. The adult cast (which also includes a very dry Mary Lynn Rajskub as the police chief, plus great cameos from Hannibal Buress and Kumail Nanjiani) help ground the movie; whereas the boys play out their small concerns on a grand, operatic scale, the adults have to deal with real-world problems and pain -- the loss of a spouse, the idea that your kids want to abandon you, wontons that are too big -- in the real world. They don't get to run away and escape to the woods for a summer. There's little doubt that movies like Moonrise Kingdom and Into the Wild will be brought up a lot in conjunction with The Kings of Summer when it comes out in a few months. I guess that's fair, since there are shades of both in the movie, but Kings of Summer is still its own thing -- a film made with beauty, personality and, for a first-time feature director, a lot of confidence. It deserves to be the breakout indie success of the summer, when audiences can take a break from superheroes and space battles and spend some quiet time in the woods, hanging out at Toy's house, eating some Boston Market.